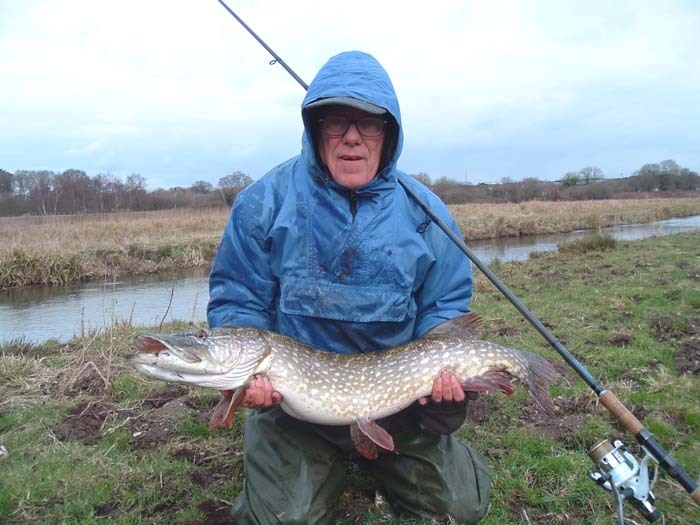 Over the years I've often read of big catches of pike from small areas of a lake or river. of course the words 'aggregation' and 'pike' sound like a contradiction. It is well known that pike will behave as cannibals and that in some waters one of the main foods of big pike is their smaller relatives. The River Frome near my home is no different to any other river in this regard and small pike are quite often found in the guts of big pike. As it happens small pike are not very good livebaits - they tend to sit in one spot and so do not 'search the water' for something that might eat them. They are much better when used as wobbled deadbaits but perhaps no more attractive than a dead dace or a mackerel 'flapper'. Anyway, the point is that you wouldn't normally expect to find more than one pike in a particular 'lie' or ambush point. In fact radio tracking has shown that at times a couple of similar sized pike will lurk within metres or even centimetres of each other. However, at this time of the year it seems not uncommon for considerable numbers of pike to gather in a single pool and I had an example this week. I was fishing with Nigel and I was using deadbaits (from my freezer) hooked through both lips on a size 4/0 circle hook. The biggest bait I had was perhaps 20cm in length. I was fishing with my usual spinning rod and it was easy to lob the bait across the river if I needed to. My second cast into a deepish pool (perhaps 2m deep) was down and across. As I twitched it past a small mat of floating plant debris under my bank a decent pike shot out from under the cover and grabbed it. I played the fish for a couple of minutes and Nigel was just picking up the net to give me a hand when - the fish came unstuck. I had another cast to the spot where the fish had let go and sure enough it took again. This time we landed the fish - a nice fifteen pounder (7kg). The fish was returned and my next cast brought the bait (the same bait) sliding past the mat of rubbish again. Out swept a pike and grabbed the fish. This one was firmly hooked and landed - eight or nine pounds (4kg). I commented to my pal that the pike seemed to have come from exactly the same place as the first one. After a few more casts we had no further bites and thinking that the pike were 'mad on' we wandered off upstream. Half-an-hour and one small pike later we returned, this time on the opposite bank to the one that produced my first two pike. To cut a long story short within the next ten minutes or so we landed four more (different) pike including a cracking fish of 22lb (10kg) from more or less opposite the first 'hot spot'. We moved on downstream but a further hour's fishing failed to produce another bite, despite some of the places looking 'perfect'. What do we deduce from these events? 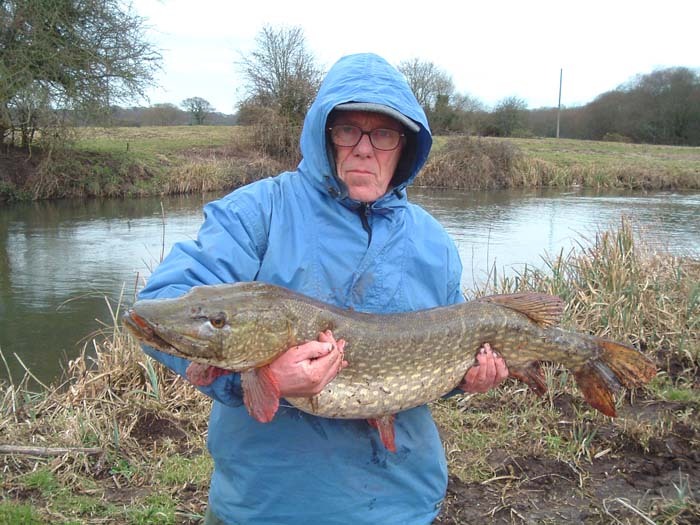 Well for sure there were at least six pike ranging from two to ten kilogrammes in a single pool no more than ten metres wide by twenty metres long. A couple of kilometres of river upstream and downstream of the productive pool seemed pretty barren. We used the same tactics throughout the session and fished the best spots we could find. It seems that, on this occasion, the pike were concentrated in one small area. Clearly they were actively feeding and the biggest fish we caught was certainly capable of devouring the smallest one. Presumably this is some sort of aggregation related to the forthcoming spawning season. The moral? Obviously, even after catching a fish, it's always worth another cast or two to the same area.